'Cat dental hygiene' is not a term you hear or see often, which is probably why routine brushing doesn’t feature in many cat’s lives. But it should, as cats are just as susceptible to bad breath, gum disease and tooth decay/loss, as many dogs and humans are. Whether your cat is old or young, the condition of the teeth is paramount to the continued health of your pet, and it is thought that up to 85% of cats aged three years and older have some degree of dental disease, which may or may not be diagnosed. My cat is nearly two years old and to my shame, I haven’t once got up close and personal with her teeth. She’s had the usual vet checks, but never have I taken a brush to her mouth and tried to clean them, or properly inspected the razor-sharp pearly whites inside. The prospect of doing so is actually quite daunting, and I’m sure many a cat owner would agree with me. That said, I am aware of the signs to look out for that may indicate a dental problem in my cat. Bad breath, for one thing, is a sure-fire sign of an issue, just as redness, swelling, excessive salivation and fur staining may also point to something untoward. Other subtler signs include difficulty or reluctance eating, pawing at the mouth, general malaise and disinterest in play, and other indications of pain. Any of these symptoms would be cause for an immediate trip to the vet. So how is dental disease best avoided? It is recommended that you get your cat’s teeth examined every 12 months, or sooner if you suspect a problem. Preventing dental disease is a lot easier than trying to treat it. Prevention can be achieved by a simple change of diet, as cats fed an exclusively wet diet are much more likely to encounter problems with bacterial build-up and tooth decay than those fed on dry kibble. This is because wet food sticks to the teeth and leaves soft deposits behind, whereas dry food helps keep plaque and tartar to a minimum by eroding it away. So how do I brush my cat’s teeth? Start by taking your cat to the vet and asking them to show you how best to brush the teeth. It might be that they recommend a finger toothbrush initially, to get your cat used to the feel of having something in its mouth. Buy a toothpaste that has been specially developed for cats, with a palatable flavour such as chicken or malt. 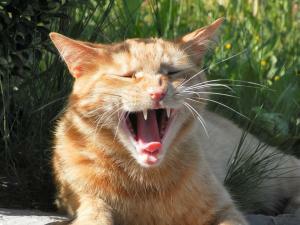 Avoid ever using a human toothpaste, as the fluoride will make your cat seriously ill if ingested. Introduce your cat to the toothpaste gradually, by starting with just a small amount on your fingertip and seeing if your cat will lick it off. Once it’s familiar with the taste and in a comfortable and relaxed state, try inserting a finger along the gum line, applying different pressures to gauge your cat’s reaction. If this is a success, try with the finger toothbrush. These are usually double-sided and go over the end of the finger like a rubber thimble. Be gentle and concentrate on the teeth that are easiest to reach. Eventually you should be able to move on to a proper toothbrush, although sometimes a finger toothbrush is sufficient. A cat’s mouth is much smaller than a dog’s and it may cause more harm than good trying to manoeuvre a toothbrush in such a small and delicate space. If your cat resists or shows signs of distress, break for a few minutes and then try again. Talk in a soothing voice to reassure your cat there is nothing to fear. If your cat remains calm and doesn’t fidget, reward it with praise and lots of back scratches. You may want to offer a specially formulated dental treat during the brushing process, or as a daily treat to keep dental disease at bay.